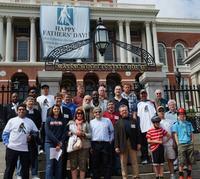 We thank everyone for joining us today June 14, 2013 on the steps of the Massachusetts State House to honor and acknowledge the many positive contributions that fathers make in our society, to family and to our children. The Fatherhood Coalition has worked for three years to have a Fathers’ Day banner on this Capitol and we are grateful that the Commonwealth has taken this step. Fathers play an integral role in every child’s life and are a positive and fundamental role model for their children. Children who grow up without a father in their life are more likely to drop out of school, engage in violence, abuse drugs and alcohol and at risk for suicide and other harmful behavior. There is no doubt that we need to do as much as we can to keep fathers with their families and children. Fatherhood, however, is currently in crisis. For decades, too many children have grown up without a father in their lives because of destructive federal and state laws that promote and encourage dysfunctional families. Today over 40% of all new births are to unwed mothers, and for teen mothers in inner city Boston that number is over 85%. By the time a child reaches their 18th birthday over 58% do not have a relationship with one of their birth parents, usually the father. The impact on men is undeniable. Middle-aged divorced dads have the highest rates of suicide. We sadly remember one Fatherhood Coalition member, Tom Ball, who in desperation at his loss of parental rights took his own life two years ago on June 15th. The unjust laws that drove him to suicide must end. Prominent among these are federal laws such as the Violence Against Women Act (VAWA) which have allowed an explosion of false restraining orders against men. Under VAWA a vindictive parent may simply check off a box on a one page form to prevent a father from communicating with his children. 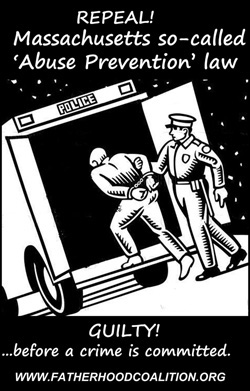 Even the most caring act such as sending a birthday card can risk imminent arrest and incarceration. Though clearly wrong and harmful to children and families such draconian actions are not uncommon today. Another law, the Bradley Amendment, ensures that non-violent broke fathers be put in jail and taken from their children for the crime of being poor, unable to afford unreasonable child support orders. Yet another law, Title IV(d) of the Social Security Act, has financial incentives to keep fathers out of their children’s lives while even the tax code has financial disincentives against keeping families intact. Here in Massachusetts we applaud Governor Patrick for setting up a working group to reform the state’s antiquated family law. We expect no less that the working group will propose revision of those laws harmful to families and thus allow the presumption that both parents have a natural right and are fit to equally share in the care and raising of their children. So today, we are pleased to honor all fathers, those married and those apart from their children by separation or divorce.